This is a game that’s loosely based on the happenings of the 2014 World Cup Finals in Brazil. 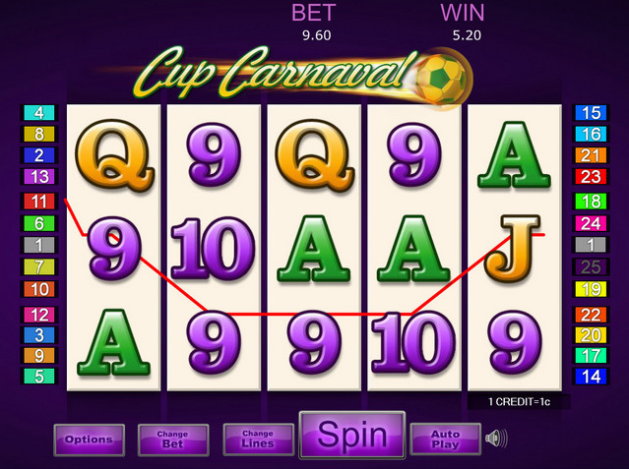 Enjoy this 5 reel, 25 payline soccer online uk slots game and revel in Brazilian flair and the beautiful flamenco dancers that will encourage you on your journey to score the winning goal to lift the free spin trophy. 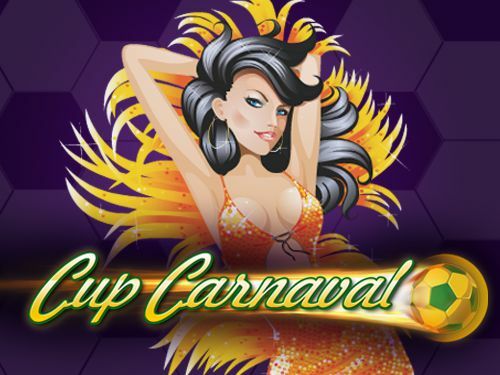 Eyecon are the masterminds behind Cup Carnaval and they are at the top of their game in the casino industry. They deliver a unique experience for their players by offering them a fully functional mobile gaming platform, meaning that a player can take their games anywhere on the go. Whether that be during your lunch break at work, escaping the world of public transport or simply enjoying a 5-minute haven from the kids. Eyecon understands those needs to get away from the real world for a little while and this vibrant, sport-tastic slot game is a guaranteed winner in anyone’s books! All this right here at good old Easy slots! Gone are the days of placing a bet on a football match – why not win money, feel the atmosphere of football, and have fun at the same time instead of anticipating yet another lost bet. The bright and vibrant colors used in the background to this slot-game are immediately reminiscent of what you would expect at a typical Rio Carnival. The game consists of the familiar 5 reels and 25 pay-line slot and from just 1p a spin to 50p, there really is no excuse to just spectate anymore in football, you can dive right in there! Click here to learn more slot games. The green and yellow football is the wild symbol which you will want to keep your eye out for. It will substitute those cards that aren’t performing to their best standard and give you a better chance of winning the score-tastic pay-outs! When it forms part of a winning combination, that pay-out is boosted by a 3x multiplier and trebled. What is worth noting here is that whenever the wild lands, it will expand to fill the rest of the reel it has been placed on. You can also expect to win 5, 15, or 300 times your total stake when you match 3, 4 or 5 of the dancing woman, which is the scatter symbol. As an extra bonus game, the Free Games feature becomes an open goal opportunity, with 15, 20 or 25 free spins up for grabs. There is also the possibility to achieve 400 free spins as the game allows you to re-trigger up to 15 rounds of free spins if 3 or more of the dancing woman appear again. This means that you are given more control of the ball to determine your own fortune, as the game is literally shooting extra chances at you to win big time! Didn’t get a chance to go to the World Cup in Rio? Well, this game allows you to shoot straight back into that same atmosphere that was felt in this football-crazed city! With just 1p a bet, it is certainly a whirlwind away from the betting world, so come and give it a shot and we are sure you won’t be disappointed! Another fast-paced game is our Beverly Hills slot.